Our toaster - I don't know about yours - has an interesting feature. When it's not plugged in & you put in a slice of bread & push down the handle, it flops the bread right back atcha. 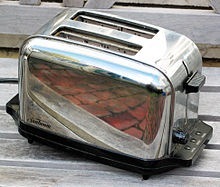 Unplugged, our toaster is all flop & no pop. It won't toast without the power. It won't even keep slices down. Are you living with all flop & no pop? Jesus declared, "All authority has been given to me," in Matthew 28:18. Authority is the power to act. He's got all of it. He'll use it for you. If you seek him. Are you plugged in to Jesus? If you do not have a personal, saving relationship with Jesus, then click here to learn more. If you do know Jesus as Savior, then ask yourself if you are plugged into & relying on him. And, leave a comment below, did you go try the flop/pop thing out on your toaster? I wanna know.